Ken Haton (L), and Dustin Berk (R), of Ninja Cards on Shark Tank. Work colleagues and good friends Ken Haton and Dustin Berk often found themselves with time to kill, and nothing much to do, while on work trips together for the event marketing company they both worked for. To pass the time during their frequent stays in hotels they began throwing their growing collection of hotel key cards at objects in their hotel room. After a while, Dustin came up with the idea of a customized board containing different value targets that they could aim for, and the basic principles of the Ninja Card game were in place. The pair began painting foam boards from their own workshops and designed some cards with a Ninja theme, inspired by Ken’s interest in mixed martial arts. They began throwing Ninja Card parties for their friends, they were surprised and pleased to discover that these enjoyable events were a great success, often continuing late into the night, and sometimes all the way through until the following day. Seeing a good business opportunity, they formed the Ninja Card company and began developing their original and unusual idea. They expanded the range of customized cards and tested different boards, tweaking the rules of the various games they had devised until they were fast moving and enjoyable, easy to play but much harder to master. When they had a product they were satisfied with, they began promoting it, and at one of their very first opportunities to do so, during the Chicago Toy Fair, they obtained an exclusive licensing deal with a major toy company within the first hour. The initial success of the business may have appeared like a good omen but unfortunately, less positive events soon occurred that sent the company into a major reversal of fortune. The toy company they had signed a licensing agreement with pulled out of the deal. The entrepreneurs continued promoting their game for two more years until, in October 2014, they appeared on the Shark Tank seeking additional funding. Ken And Dustin had produced an unusual and enjoyable game, their arrival into the Shark Tank could be described in the same way. Dressed from head to toe in black, two silent and deadly Ninjas swept into the room like a gust of air, well almost, these Ninjas looked slightly less deadly than the average ninja but they still made a dramatic entrance when they needed to. They incorporated a forward roll or two into their approach before they finally stood before the sharks and revealed their faces. Dustin introduced himself as ‘Dustin The Red Dragon’ and Ken claimed he was known as ‘Ken The Butcher’, although by whom was not made clear. They announced they were seeking a $60,000 investment in exchange for a 30% stake in their business. Ken began the pitch by talking about the mysterious ways of the ninja, their incredible abilities, their strict moral code and the fact that such attributes made them the envy of all. He finished the pitch by assuring the Sharks that they too could be ninjas, and with that announcement, Dustin unveiled a large custom Ninja Card game board and they both began throwing cards into the board with super fast ninja speed. The fast and practised throwing of the two entrepreneurs impressed the sharks, who all uttered appreciative noises. Dustin elaborated on the basics a little more, explaining that the principle of the game was the same as darts, except they used cards instead. Customers could play a variety of games that the pair had designed or alternatively, they could simply make up their own games. The possibilities were endless he informed the sharks but, in order to truly appreciate the game, you had to play it for yourself. With that, Dustin announced that he and Ken would like to see two sharks compete in a Ninja Card battle. Robert Herjavec instantly jumped out of his seat shouting ‘Me, Me, Me!’ excitedly, while Daymond and Kevin raced to be his opponent. Kevin somehow beat Daymond to the front and joined Robert to commence battle. Ken ran through a few basic throwing techniques with them and announced that they had brought a special customized board into the tank especially for the battle of the Sharks. The board contained fairly lifelike portraits of the sharks all dressed in Ninja gear, it was a nice touch and it showed the extra versatility of the game with the addition of personally modified game boards. The tournament between Robert and Kevin was the kind of competitive contest you would expect from two such successful and driven people, but Kevin O’Leary, who turned out to have a deadly and accurate side-throwing technique, was the clear winner at the end. Robert didn’t seem to mind losing this competition to Kevin too much, he clearly enjoyed playing the game, as did Kevin, who declared ‘It’s kind of fun’ afterwards. Lori asked if the cards were just normal playing cards, Dustin confirmed they were essentially the same, but just slightly thicker. Lori asked about the board and if it was made from thick Styrofoam, Dustin confirmed that it was made from that exactly. Robert asked how many of the games the pair had sold so far. Dustin revealed that they had made 100 units initially and had sold them all. There was a slightly shocked silence from the sharks for a moment. Mark Cuban lowered his head and shook it, he appeared to be grinning as he did so. Daymond said ‘A whole one hundred units, Wow!’ in a voice dripping with sarcasm. Robert Herjavec asked in what period of time those units had been sold, he laughed as he asked it. Dustin admitted that sales had not been good, but there was a reason for that. He explained to the sharks about the initial licensing agreement they had signed within an hour of arriving at the Chicago Toy Fair, and the subsequent cancellation of the deal. He explained that the agreement had failed due to the toy company they had signed with having problems sourcing the materials for the boards. The sharks looked confused at this news, ‘How could they not source it?’ asked Lori. Robert appeared equally surprised and said ‘It’s just Styrofoam’. ‘It’s not exactly Styrofoam’ revealed Dustin, even though he had claimed earlier it was exactly that. After further prompting from Robert he called it a ‘Special craft foam’ and seemed unwilling to give too much information about the material away. Kevin clarified with the pair that when their licensing agreement had fallen through, the rights to the game had reverted back to them, Ken confirmed that was the case. Mark Cuban asked when they had regained the rights, Dustin confirmed it had been late the previous year. Mark wanted to know what they had been doing since that time. Dustin didn’t answer that question well, he mentioned attempts to reduce costs and seek investors, but overall he left the sharks with the impression that he and Ken hadn’t had a busy schedule recently. Robert asked if the pair had tried to obtain a new licensing deal with another toy company. In his weakest response yet, Dustin admitted that they hadn’t because ‘They didn’t really know any toy companies’. Lori pushed the point further, she told Dustin that if they had been to toy fairs and conventions, they should have a range of contacts who they could approach for a new deal. Dustin was looking more hesitant than ever and he admitted that the product had never reached full production beyond an initial few hundred units. The sudden loss of Dustin’s ninja persuasion skills soon helped the first shark made a decision. Mark Cuban announced, somewhat cryptically, that he was ‘Happy to be a disciple of the Ninja Way’ but the Ninja Card business was not for him. With no further explanation, he confirmed he was out. The lack of action from the entrepreneurs had not impressed Robert Herjavec, who pointed out that a ninja would lay their life down for the service of a greater good, yet Ken and Dustin had not even bothered to pick up a phone to call another toy company. Robert didn’t see enough ‘hustle’ from the pair, and for that reason he left the negotiations too. Lori loved the idea of the game, and she believed that kids would love it too, but in a virtual echo of Robert’s sentiments, she expressed dismay at the lack of activity from them in the wake of the licensing deal collapsing, and for that reason she was also dropping out. Daymond spoke next and he had no better news for the ninja entrepreneurs. He had little experience or interest in the toy market, what little experience he did have didn’t give him any desire to invest in the Ninja Card business. He explained to Ken and Dustin that he didn’t want to ‘Fall on that sword’ with them, revealing his own expectations for the business, and he dropped out too, leaving Kevin O’Leary as the only remaining shark still involved. When Kevin O’Leary speaks last, after all his fellow sharks have failed to be impressed by a product, he usually delivers a quick, and sometimes brutal, dismissal of a Shark Tank applicant with little time for humor or jokes. In this instance however, Kevin was less savage. Rather than his customarily truthful, but alarmingly direct destruction of a business idea, he merely suggested that Ken and Dustin take their game board ‘Behind the Dojo’ and throw a poison dart into it. He quickly confirmed that he too was out, in case he hadn’t made himself crystal clear, and the Ninja Card businessmen left the shark tank without a deal. Ken and Dustin spoke after their shark tank appearance and explained that they hadn’t pursued another licensing deal as vigorously as the sharks believed they should have done, mainly because they had further design ambitions on the product itself and felt it could be improved further before manufacturing recommenced. The lack of interest from the sharks wasn’t shared by all of the viewers of the show, within 48 hours of the program airing, the Ninja Cards website had over a million hits. The 400 units the business had in stock were snapped up and another 200 were ordered. The attention brought more useful contacts to the pair too, with several interested potential investors approaching them. The business is growing steadily now in 2018, and the well designed website offers a range of boards, cards and game sets at a variety of prices. 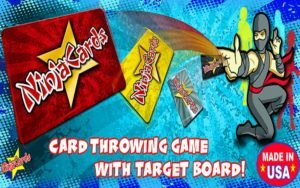 The business caters not only for individuals who wish to perfect their Ninja Card throwing technique, but they also market towards the corporate events and party market. They offer custom designs to customers specifications and are looking to arrange national Ninja Card tournaments in the future, although they currently only hold such events locally. 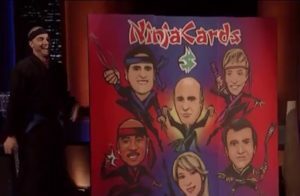 The Ninja Card Company of Ken Haton and Dustin Berk may have failed to have hit the target when it was pitched to the sharks but they may have missed a popular and profitable opportunity in this case. The enthusiasm that the entrepreneurial duo showed for their made-up game, created solely to relieve boredom, seems to be shared by plenty of others. Whether or not they are real ninjas, Ken and Dustin might make a killing with their unique and innovative card-throwing game yet.